When Was The Last Time That the U.S. Unemployment Rate Hit 10%? In early 2000, the unemployment rate in the United States was hovering at just around 4%. Fast forward to January of 2003. The unemployment rate was now 5.8% - still high, but not that bad considering that the country was in the midst of recovering from the post 9/11 recession. 6 1/2 years have now passed, and we are perilously close to topping the 10% mark for the first time in nearly 30 years. In January of 2003, a 10% unemployment rate would have seemed nearly inconceivable to most people. In January of 2000, a 10% unemployment rate would have been laughable. However, while the pace of job losses is starting to slow, many economists agree that we will more than likely top the 10% mark before things start to improve. This begs the question - when was the last time that we saw an unemployment rate of over 10% in the United States? And what were the circumstances that brought about this spike in unemployment? Let's first head back to the late '70s. 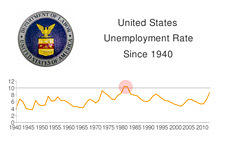 In 1978 and 1979, the unemployment rate in the United States was averaging about 6%. A bit high, but nothing to lose too much sleep over. In the first half of 1980, the unemployment rate started to spike. The December 1979 unemployment rate was 6% - by June of 1980, it had spiked to 7.6%. Throughout 1980 and the first half of 1981, the unemployment rate in the U.S. remained in the mid 7s. in the second half of 1981, the rate really started to move higher. By the end of 1981, it was up to 8.5% - by September of 1982, the unemployment rate had climbed past the 10% mark. The unemployment rate remained over 10% for a full 10 months, topping out at 10.8% in both November and December of 1982. By the summer of 1983, the unemployment rate in the country had fallen below 10%, and by June of 1984 it was at 7.2%. This was the last time that the unemployment rate topped 10% in the United States. Many people assumed that we were in a new era of economic prosperity and would never come close to a 10% rate again. So exactly what happened to cause the spike to 10%+ in the early 1980s? The answer - a severe recession that was the result of high inflation. Interest rates were increased to staggering levels in order to fend off high inflation (prime interest rate was 20%+ for a time in 1982), which ended up causing the S&L crisis. This recession was a shock to the country, and many people wondered at the time if the United States would ever pull through. Citizens took out their frustrations on Ronald Reagan, sending his approval ratings through the floor (which is quite remarkable when you consider how popular he ended up becoming). Eventually the economy regained its footing, and Reagan sailed to victory in the 1984 election. There were some pretty dark days in the early '80s though - pretty similar to what we are feeling in 2009. By the mid-80's, an extremely patriotic feeling swept the nation after the recession had successfully been conquered. Will history repeat itself this time around? Will the country resurrect itself after sustaining a number of serious body blows? Or will things be different this time? Will the unemployment rate end up north of 15%, as some doom-sayers are now predicting?